I am excited for my last 2008 giveaway sponsored by Edible Baby. 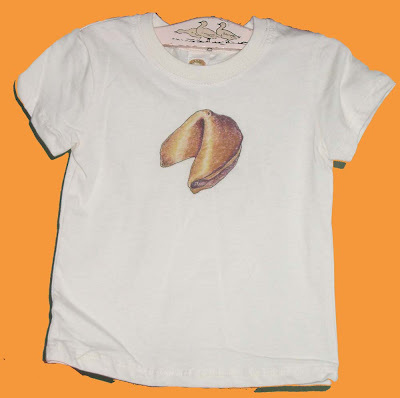 I got the fortune cookie, The Future Remains to be Seen, t-shirt above for my 2 year old son to wear on New Year's eve. Isn't it so cute? 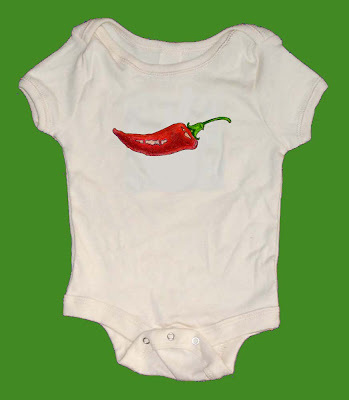 Edible Baby makes t-shirts and onsies with food items printed on them. Their cotton fabric is so soft and the packaging is fabulous. For a chance to win visit the Edible Baby website and choose which onsie or t-shirt tickles your fancy. Come back and leave a comment on this post telling us your choice by Tuesday January 6th. One comment will be chosen at random. If you win you get the product you wrote about in your comment. write about this giveaway on your blog. Just write an extra comment here with a link back to your blog. I liked the "Go Bananas" tee. I love the little chocolate bunnies onesie - very cute. I like the turkey leg t-shirt...It's too cute! Aww! I love the Go Bananas Tee or the California Dreamin Hoodie! Ahh send me the Go Banana's tee shirt in medium.I am a subscriber. The california dreamin' ORGANIC toddler is my pick. I love the "my cherry amor" key lime onesie! I like the "picked from the pumpkin patch ORGANIC" onesie best. Thanks for the giveaway! I would love Go Banana for my daughter. She loves bananas! I love the "future remains unseen" toddler shirt, so cute! I like the candy apple onesie. I'd love the toast toddler shirt for one of my cousin's baby. And I made a post for you on my own blog for you as well. I love the little banana tee in 2T -- We are vegetarians in our household and my daughter LOVES bananas! how fun would it be to get a shirt featuring them! The Go Bananas tee is very cute and my favorite! Red Hot Chilli Pepper is my favorite. I like the little chocolate bunnies onesie! i like the go bananas tshirt. I love the Cherry Baby Organic toddler tee. Love the Bananas tshirt. My daughter is 6 months and we call her Monkey! i love the organic "the future remains to be seen" onesie. Would love that for the new baby! the all amercian onesie! gatta love a good cheeseburger! the little banana tee in 2T is cute! I have subscribed in my yahoo. Love the little chocolate bunnies onesie! thanks! I love the red chili pepper t-shirt. I think the my cherry amor onesie is adorable! I like the Go Bananas kids' tee. I like the white "my funny valentine" ORGANIC onesie. chocolate bunny organic toddler t --adorable! Little Chocolate Bunnies Onesie in 12 - 18 months light blue is my very favorite one. The sweet as candy onesie is so cute. Thanks. My favorite is the kelly green My Cherry Amor onesie. These are all very cute. I finally picked "the future remains to be seen" organic onesie over the "red hot chili pepper", but it was a tough decision. These are so cute. I really like the california dreamin' ORGANIC onesie. I love avocados. Thanks! I like the Let Them Eat Toast kids tee, my son LOVES toast for breakfast! Cute, thanks for the giveaway! My favorite is the california dreamin' ORGANIC onesie in size 6-12 months. Thanks! I like the chocolate bunny shirt. Thanks! I'm a subscriber! Thank you for the giveaway! Thanks for the chance to win! I like the Pucker Up organic onesie. I like the my funny valentine ORGANIC onesie. Thanks! I love the red hot chili pepper onesie in light blue! in white! But the avocado one, fortune cookie & french toast ones are also cool! I like the All American shirts. I am glad that they have bigger sizes. My 8 year old often gets left out of the cool giveaways. I like the "Let Them Eat Toast" tee. I like the chocolate bunny organic toddler t-shirt! cant chose between go bananas and chocolate bunny!! I like the little chocolate bunnies onesie. my favorite is the california dreamin' ORGANIC onesie. I love the let them eat toast onesie. SO cute and sure to catch people's attention. I love the "future remains to be seen" onesie! I think they are all adorable and really had a hard time choosing one - but I'm going with the "California Dreamin'" Toddler Tee. i love the California Dreamin Toddler Tee. We love avacados in our family!!! The picked from the pumpkin patch ORGANIC onesie is really cute! I'm in love with the "Future remains to be seen" onesie! I like the chocolate bunny tee. The Go Bananas T is really cute! My favorite is the little chocolate bunnies onesie! My baby is due in late feb. so the my funny valentine onesie is perfect! I love the litte chocolate bunnies onesie. Thanks for the contest. I like the red chili pepper t-shirt. I love the "Go Bananas" Tee! My favorite is the let them eat toast kids T, 6/8 lime green. The 'go banannas' onsie, or the let them eat toast is a hoot too! I love the my funny valentine kids T in pink! Blogged this and other great giveaways here. Thanks! I like "My Funny Valentine" kids tshirt (size 2-4, black). black and white cookie ORGANIC onesie is my favorite of them all. I like the black and white cookie ORGANIC onesie. It reminds me of ying and yang. I like the picked from the pumpkin patch ORGANIC onesie! I love the my funny valentine ORGANIC onesie! Cute! My favorite is the the future remains to be seen ORGANIC toddler tee. My favorite is the let them eat toast ORGANIC onesie. I love the grilled to perfection kids T! I love the Go Bananas T, thanks for the chance to win. I like the My funny Valentine tee. I'm not sure what time zone you're in, but I'll give a shot for your awesome giveaway! I'd love to win a cherry baby ORGANIC toddler T. Thank you! I love your blog, so I'm now a follower! I've subscribed to your feed via google reader.